Not many people know about Uisneach but it really is a special place. Situated in the very centre of the island of Ireland, in County Westmeath, it has been referred to as the navel of Ireland. At its centre is Aill na Míreann (the stone of the divisions, seen above) and this is where the borders of the five ancient provinces of Ireland met. There was a real 5th province known as Mide once upon a time but this province could also have referred to the world of the imagination or the magical ‘otherworld’, where the Tuatha Dé Danann now dwell. 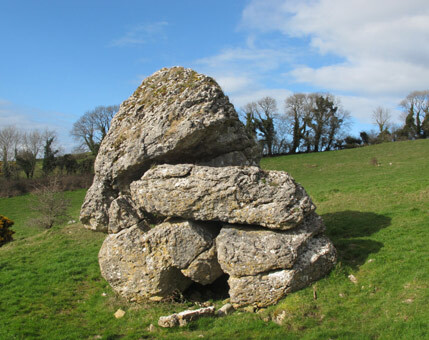 It is said that under this 30 ton stone, the earth goddess Éiru was buried - Éiru who gave us the name of our country - Éire. 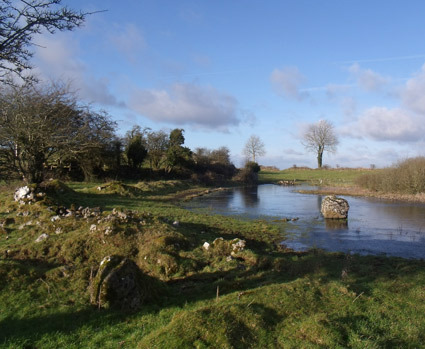 And Uisneach is also where the sun god Lugh was drowned - Lugh who defeated Balor of the evil eye with his Claidheamh Soluis (his sword of light). Unfortunately, he was drowned in this hilltop lake and laid to rest in a nearby tumulus, or so they say. So we travelled to Uisneach at the weekend. As you know, Sunday was the first day of February, the first day of Spring, Imbolc as it was known in the old days, or nowadays: Lá Fhéile Bríde, St Bridget’s feast day. And that’s why we made the journey, to mark the day. But anyway, we went there last Sunday and it was one of those beautiful, frosty mornings that makes one glad to be alive. The hill of Uisneach is only 600 ft. above sea level but there are stunning views in all directions from the summit. It is said that from there, you can see hills in twenty of Ireland’s 32 counties. You stand there where the druids once stood, where Bridget stood, where countless generations of Irish people gathered… it’s a wonderful experience but a humbling one. We are quite insignificant, aren’t we? Ah well, it’s never too late to begin again. Spring has arrived.